The Camerons moved to the Isle of Wight in 1860, choosing to settle in a property adjoining the Farringford estate which they christened ‘Dimbola’. 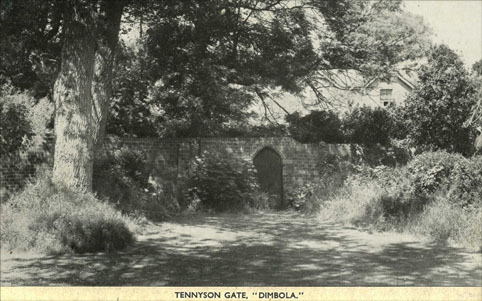 A special gate was installed at the back of the grounds so that Tennyson could walk between Farringford & Dimbola unharassed by pesky members of the public. A postcard from around 1905 showing the gate. Following the Camerons’ arrival in Freshwater on the Isle of Wight in 1860, Dimbola Lodge quickly became the social hub of the village. Dimbola Lodge was saved from the bulldozers at the last minute in the 1990s. Today it is a museum with permanent exhibitions of Julia Margaret Cameron’s work, contemporary photography & the Cameron Tearooms.